Faroe Islands 0 Scotland 2, 06/06/2007. European Championship Qualifier. 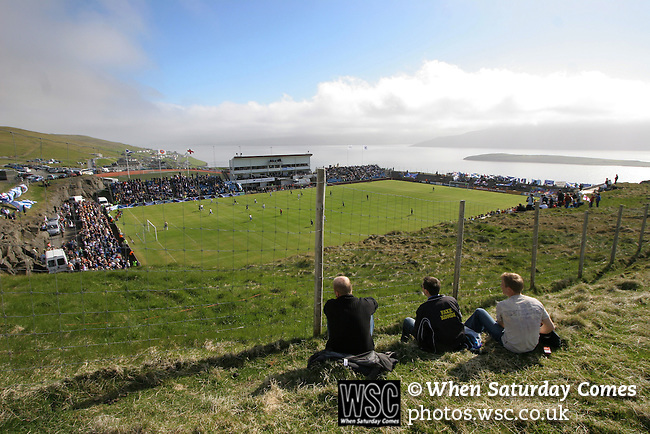 Three Faroese fans watching the action from the hillside outside the ground as the Faroe Islands take on Scotland in a Euro 2008 group B qualifying match at the Svangaskard stadium in Toftir. The visitors won the match by 2 goals to nil to stay in contention for a place at the European football championships which were to be held in Switzerland and Austria in the Summer of 2008. It was the first time Scotland had won in the Faroes, the previous two matches ended in draws. Photo by Colin McPherson.